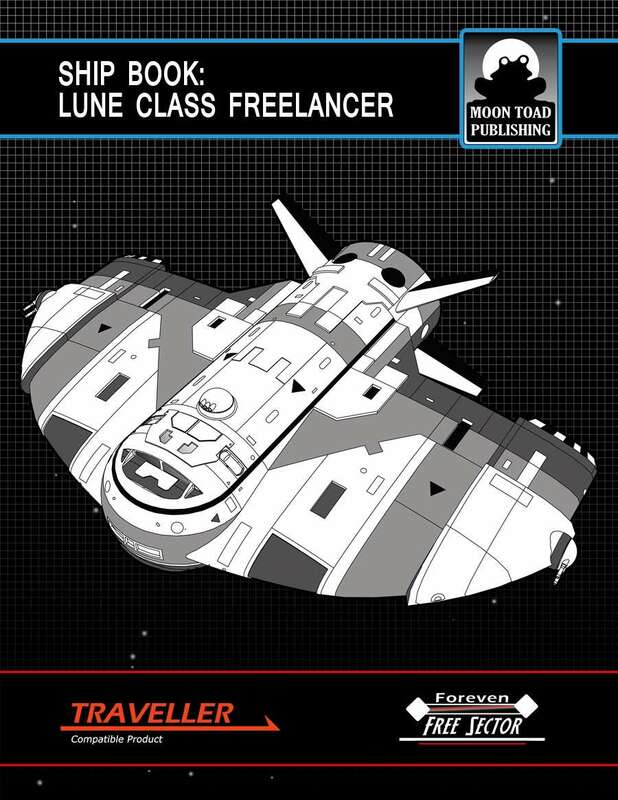 Following on from my Ship Book: Panga-class Merchant review, I’m going to move swiftly onto the Lune-class Freelancer and Ship Design Sheets, also by Ian Stead of Moon Toad Publishing. I’m writing this article whilst sat in a sunny breeze, overlooking Freshwater Bay in the Isle of Wight, one of my favourite places to relax when on holiday. My Vargr editor-in-chief (my pet Greyhound) Millie will be checking the spelling of the article from the comfort of the back of her transport vehicle! The former book is a 42-page PDF available from Drivethru RPG for a very reasonable $7.51. The format is watermarked PDF and follows a similar format to the Panga-class Merchant product previously reviewed. The Lune-class is pitched as a possible alternative to the typical 200-ton Beowulf-class free trader that many adventuring parties start out with. Instead, it is 300-tons in size and offers a number of advantages over the Beowulf; namely it can carry a crew of six, has jump-3 capability and 4G acceleration. There are three hard points and can carry a small launch of sufficient size, it can carry a limited amount of cargo. Delving into the book, the first nine pages written by Ian Stead and Eric Lyon-Taylor provide the introduction, some examples of notable ships, deck descriptions and non-Traveller ship specifications.The following four pages then describe an example crew, the text bolstered with more fine (character, rather than vehicle) artwork by Bradley Warnes. The remainder of the book is given to game specifications, well laid-out deck plans and descriptions of the Lune-class variants (being the M-merchant and G-gunship), spacecraft record sheets and the Gillow-class launch (with its assault version). All the game information about the ships described are of the writers usual high quality and detail. There are plenty of line, monochrome and colour pieces of artwork to ensure that the text does not get too heavy to read. I’d be more than happy to trade my Beowulf-class ship in for a Lune-class spacecraft (er, if I had one), it offers a greater degree of flexibility for more varied operations by its crew, as long as the players can afford its new 181MCr price tag! It is a nice-looking ship, it means business and is the sort that would serve a crew for many years. The book is great, I found it interesting to read and thought-provoking in where or how I could use one of these ships in a game. If I had a criticism, I would have liked to have read more about the history of the ship and its background as this fell slightly shorter of the extensive description in the Panga-class book. Howesver the book is highly recommended if your players are in the market for a new spacecraft, or you are looking to use one in a campaign. Moving onto the Spacecraft Design Sheets, this is a Mongoose Traveller game aid to help with the ship design process and collates much of the tables and charts from the Traveller main rulebook and High Guard. From the 17 pages in the book, 13 are the actual tables and charts needed to create spacecraft from small ships, right up to capital ship size. This is a functional product, it crams a large amount of information into several pages to make it easier to build spacecraft. The charts are clear, even though there is quite a bit of information to go through (a there really that many charts and tables?!) There aren’t any scenes or images to break up the text, as the book is designed to be printed and if necessary laminated and make a creative process easy to go through. 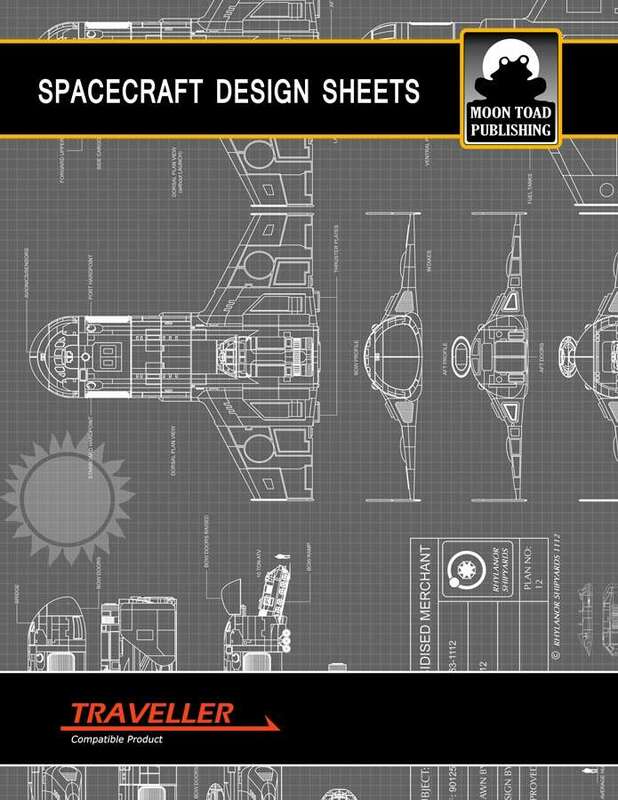 The Spacecraft Design Sheets in PDF form are a snip at $2.50 from Drivethru PRG. I can’t vouch for the accuracy of the charts (I’m not of the mind to double-check all the numbers) but I’m sure Ian and his writer-assistant Michael Johnson have double-checked everything to make sure its accurate. A very useful piece of reference material that will prove its worth purchasing. I’d like to sincerely thank Ian Stead Moon Toad Publishing for sending me copies of the books to review and providing me with a good holiday read! This entry was posted in Classic Traveller, Mongoose Traveller, Traveller TNE and tagged lune, Moon Toad Publishing, Panga, spacecraft design sheets. Bookmark the permalink.